Paul Mattick shows that corresponding to the absence of a socialist movement in America is the absence of fascistic movements as attempted resolutions of extreme class conflict. The complacency of the American working class, however, depends upon continuing capitalist expansion. Thus, the limits imposed by the developing crisis create the possibility of a break with the belief that politics can be safely left to the bourgeoisie. An article by Paul Mattick Sr. published late 1978/early 1979 in Root & Branch magazine (No. 7). Reflecting on the New Deal, Franklin Roosevelt once said that his government "has done everything that Hitler has done, but by other means". These other means, however, were not able to overcome the Great Depression which occasioned the large-scale governmental interventions in the American economy. It was finally only the resort to Hitlerian means—that is, participation in the imperialist war—which overcame the unrelenting crisis. Still, the internal situation in America differed greatly from those prevailing in the fascist nations. The United States remained democratic, not only ideologically, but also practically, with an absence of terroristic measures. A social consensus and an efficient prosecution of the war could be assured without much interference in the customary social and political institutions. To be sure, there were some violations of civil liberties such as the incarceration in concentration camps of Americans of Japanese extraction. But by and large the arbitrary discriminatory actions on the part of government were not comparable to the dictatorial policies of the totalitarian regimes. The manufactured mass hysteria of World War I reappeared, of course, but in a more subdued fashion. The actual outbreak of the war united interventionists and isolationists behind their war-happy government. The acquiescence of the population was obvious and in part based, no doubt, on the intuitive recognition that the war would bring the depression to an end. Emerging out of economic crisis, fascism was an attempt to secure the threatened capitalist system by political and organizational means. These means were necessarily directed against the interests of the working class, in order to create the preconditions for new imperialistic adventures. This involved the destruction of the relative independence of the existing labor organizations, so as to establish that degree of class collaboration and national unity required for a political solution of the crisis at the expense of other nations. A repetition of the voluntary acceptance of the imperialist imperative by the labor movement, as during World War I, could not be expected under the prevailing crisis conditions, characterized as they were by an intensification of the class struggle. A new ideology, apparently directed against both the warring classes, had to be brought forth to transform class interests once again into national interests. This ideology could only be given practical form by way of political struggles, through the creation and growth of new organizations, which issued in the establishment of fascist dictatorships. In this sense, fascism expressed the capitalistic need for a total control of the working population, which seemingly could no longer be achieved within the confines of bourgeois democracy. It was, and still is, the total absence of a class-oriented labor movement which helps to explain the persistence of democracy in America, even under conditions of great social stress. This absence finds its reasons in the particularities which have distinguished the development of capitalism in America from that in other capitalist countries. Although interrupted by crises and depressions, American capitalism unfolded progressively, until the United States became the most advanced and the strongest capitalist power. It became therewith less susceptible than others to the formation of anti-capitalist movements, for it proved able at the same time to accumulate capital rapidly and to improve the living standards of the great mass of its population. To a lesser extent, this was true also for the European nations, yet the very rise of capitalism there was accompanied by a far more intense exploitation and a greater misery of the working population than was the case in the United States. At any rate, the specific European conditions led to the formation of socialist ideologies and organizations, which persisted even after conditions began to improve. We will not dwell here upon the rather complex reasons which hindered the development of socialist movements in the United States, but merely register the absence of such movements as a specific American characteristic. This is not contradicted by the sporadic appearance and disappearance of socialist and syndicalist organizations, which, at times, agitated both the bourgeoisie and the working class. These organizations did not represent the real aspirations of the mass of the working population, which was resigned to accept the capitalist system as its own. The only movement which achieved some social significance was trade-unionism: the utilization of the labor market for the improvement of wages and working conditions within the—unchallenged—capitalist relations of production. It had no political ambitions but was happy with the conditions of democracy in its American form, that is, the two-party system, which provided no more than the semblance of democracy in its traditional European sense. Politics was left to the ruling class, as a matter of resolving those differences within the bourgeois camp which do not impinge upon its common needs. The illusion arose nonetheless that political frictions within the bourgeoisie provided a lever for the working class to affect policy by siding with either one or the other of the bourgeois parties. A kind of blackmail politics took the place of the political class struggle. The lack of political initiative on the part of American labor, reflected in the apolitical nature of the trade and industrial unions, led to the complete ideological integration of these organizations into the capitalist system. Of course, just as capital competition continues within the general trend of its concentration and centralization, so the fight between profits and wages goes on in spite of the apparent community of labor and capital. It is a struggle for shares of the social product brought forth by the capitalist system which both sides agree to uphold and to defend. The mass of the American workers does not object to the capitalist system, but merely to its pressure upon wages, caused, in their view, by the greediness of their employers rather than by the system as such. They are prepared to fight for the maintenance of once-reached living standards, or even for a larger share of the pie, but within—not against—the capitalist system. The wage struggles are carried on, often with great militancy, in the belief that the capitalist system is capable of doing justice to both labor and capital. And with a rapid rate of capital accumulation, implying the increasing productivity of labor, both profits and wages may rise, if only in unequal measure. It is then the experience of the past, which still determines the attitude of American labor with respect to the capitalist system. Only a minority of American workers are unionized and the unions themselves vary greatly with respect to their bargaining power and the character of their bureaucracies. But all exclude effective control on the part of their membership; which is to say, the workers accept the unions in the same sense in which they accept American capitalism as a whole. With the legalization and institutionalization of the unions, which dates back to the New Deal of the Great Depression, "organized labor" itself became a part of the system, confronting the workers as an objective reality outside their own control. Union dues are paid in the same spirit as taxes are paid, but there is neither a way to, nor as yet a demand to, participate in union affairs. Everything is left to the bureaucracies, just as politics is left to the bourgeoisie. In both cases the democratic forms are often maintained, of course, via elections and referenda, but they do not affect the authoritarian controls of either governments or unions. The personnel may change; the system remains the same. The concentration and centralization of capital in the United States has progressed to a point where the specific interests of the big corporations determine the destiny of the system as a whole. It was no joke when it was said that "what is good for General Motors is good for America", for it does depend on the fortunes of General Motors, and on those of all the other similar corporations, whether the economy expands or contracts. In this situation, the state is the state of the corporations and depends on their profitability. Whatever differences may have existed between state and capital, they have since long been dissolved; the state is not a mere tool of the ruling class, the latter is also the state. It is for this reason that the people in government office, or any public office, need not be pressured by the big corporations to do their bidding; they do so on their own accord. Moreover, the personnel of state and capital are interchangeable; corporation managers enter government service, while state officials move into the management of corporations. If government and capital are one and the same, this entity finds its support in the Senate and the House of Representatives. Democratically elected, the congressmen have been chosen to uphold the capitalist system and its state. They do so not only out of conviction, but also because of their direct capitalistic interests. As, according to Calvin Coolidge, "the business of America is business", politics itself is seen as just another money-making enterprise, to be supplemented by branching out into other businesses, or by maintaining those already engaged in. The New York Times of 8 May 1978 reported a computerized study of the personal financial interests of almost all the members of Congress, which demonstrated that these people are also investors in all sorts of enterprises, often using their official positions to advance their business interests. As the information on which the study was based was supplied by the congressmen, the data were of course understatements serving to distract attention from or conceal their true but unascertainable financial holdings. For our purpose, however, the study substantiates the fact that the representatives of the people are also capitalists who secure their privileges through the democratic process. The relegation of all decisive economic and political power to the hands of capital and its government has not as yet destroyed the myth of American democracy. People can vote, and those who vote—about half, or less, of the eligible population—can exchange a Democratic administration and presidency for a Republican administration and presidency; that is, they can exchange one set of people for another, equally determined to maintain the system which, in turn, determines the range of their own activities. Thus, although big business dominates the United States and cannot be dislodged short of destroying the capitalist system itself, it continues to dress its authoritarian rule in democratic garb. In fact, the more the ideology of democracy is nourished, the less bearing it has upon reality. Originally, political democracy was the goal of the emerging capitalist class and came to express the political aspects of capitalist competition, without ever concerning itself with the exploitative class relations upon which the whole capitalist edifice rests. In the European nations, the illusion nevertheless arose that bourgeois democracy could be utilized by the laboring class to alleviate its lot within the capitalist system and could, perhaps, even allow for the formation of socialistically-inclined governments and thus extend democracy into the socio-economic sphere. In America, however, as we have seen, this illusion never arose, and the private-property relations of capitalism remained generally sacrosanct. This has not changed despite the transformation of a dominantly competitive capitalism into that of the large corporation and the monopolization of capital, which even precludes political democracy in the ordinary bourgeois sense of the term. In America democracy begins and ends with the ballot-box. But it is also perceived as involving free speech, free assembly, and freedom of the press. Generally, there is no interference with these civil liberties, for they are not made use of in opposition to the capitalist system. What opposition flares up from time to time demands improvements of the system, not its abolition, such as clean government, lower taxes, civil rights and, more recently, the protection of the environment. It is noteworthy that such demands are not raised by the workers but by the middle class, and express its particular frustrations. With their upward mobility increasingly restricted, and their unhappiness at submerging into the working class, they imagine the possibility of a well-functioning capitalism, capable of satisfying all social layers. They have taken up the opportunism and reformism which, in the European nations, transformed the character of the labor movement. Compared with the welfare ideology of the liberal part of the middle class, the American workers appear reactionary, by displaying no interest in social affairs except with regard to their wages. The opinions of the politically conscious elements of the middle class are therefore destined to be voices in the wilderness. The kinds of politics carried on by elements of the middle class do not transcend the capitalist system. Even in their limited sense, they remain purely ideological, since there is no material force behind them. Still, as long as they are allowed to assert themselves, democracy appears as a reality with some effect on the course of events. This illusion supports the monolithic rule of capital. There is then no need to remove the democratic safeguard, even if this should prove inconvenient at times. In any case, it does not represent a danger that could not be met by the ordinary means of government oppression. The democratic forms are thus maintained as an asset rather than a liability of capitalistic rule, yet kept in bounds by the changing needs of the latter. This often leads to violence, based, on the one side, on the illusion that it is possible to divert the government from a particular course of action through the assertion of democratic rights, and, on the other side, on governmental assertion of authority in response to protest. Yet, after each such emergency, American democracy finds itself restored. Any temporary abrogation of democratic rights is undertaken in the name of democracy, identified, as it is, with Americanism. Anything more than verbal opposition is at once branded an attack on democracy, which presumably reflects the general consensus. It is seen as Un-American because it goes beyond the prescribed, though ineffective, democratic rules, as they evolved in the United States. Being Un-American, it is perceived as a foreign implant, which could not possibly originate on American soil. While, at first, it was the unassimilated immigrants who were held responsible for all the unrest in the nation, later it was allegiance to social systems other than the American which supposedly carried the germ of discontent into the American fabric. To make the world "safe for democracy" required then the simultaneous pursuit of the internal and of the external enemies of democracy and therefore of American capitalism. Even ordinary wage-struggles were often denounced as the work of foreign agitators, bent on undermining American democracy. Despite the actual insignificance of these political currents, laws were passed against anarchism, syndicalism, and bolshevism. Even the democratic Socalist Party found itself outlawed during World War I; all in the name of American democracy. Fascism, were it to come to America, would not require popular participation as it did in Europe. It would most probably be called anti-fascism, as the American fascist Huey Long supposedly asserted, or simply 100% Americanism. Without popular participation, there would also be no opposition; it would be a matter entirely of the government's decision. Repressive measures could be introduced within the framework of American democracy, preserving its forms while emptying them of all their content. The ruling class, in short, has managed to gain totalitarian control with precisely the instrumentalities that were supposed to curtail the monopolization of power and the absolute rule of the capitalist oligarchy. Class society implies the systematic manipulation of "public opinion" as an instrument of class rule. The specific interests of the ruling class must be made to appear as the general interest. But in capitalism, ideas are also commodities, whose producers and dispensers find a market only in the ideological requirements of capitalism. It is therefore not surprising that the media of persuasion—the schools, the universities, the churches, the press, radio, and television, etc.—cater exclusively to the needs of the capitalist system. But where there is a market, there is also competition, and the ideologists may vary their wares to some extent, even though all of them have to serve the same purpose, namely, ideological support of the status quo. These variations on a single theme support the democratic illusions within the authoritarian conditions of American capitalism. The most reactionary ideas insist upon their compliance with the democratic ideal, even if this ideal refers to past conditions rather than to present-day reality. Notwithstanding the conditions of monopoly, politics remains not only a business but a competitive business. This competition expresses itself in ideological terms. Although everyone agrees on the merits of American democracy, there is no agreement as how to serve it best. This makes for the subjective element in American politics, that is, the struggle of politicians to gain entry into the political institutions, or to increase their importance within them. The subjective strivings of the politicians becloud the fact of their objectively determined identical functions. But their antics are often topical enough to find a wide response, particularly if this suits governmental policies and specific capitalistic interests. Irrational assumptions become, at times, the reality of the day, as did, for instance, the Red-scare in the wake of World War I and McCarthyism during the cold war period. In the first case, a nationwide hunt for subversives was instigated as a kind of publicity stunt to further the presidential ambitions of the then Attorney General, A. Mitchell Palmer. At the same time, however, in the context of the Russian Revolution and its international repercussions, the fabrication of a threat to American capitalism could be used not only to ferret out an incipient radicalism but to subdue the working class as a whole. Similarly, McCarthyism, despite its source in the private political ambitions of its author, could spread as far as it did because it served the ideological requirements of American imperialism. What is of interest in this context is the susceptibility of American democracy to the same type of demagoguery that created the mass-hysteria and the fear of terror in the totalitarian nations. Only what has been, and remains, more or less the rule in these nations has been an exception in the United States. But it is an ever-ready possibility and another indication of the essentially authoritarian nature of American capitalism. A counterpart to the potential but mostly latent totalitarian tendency are the sporadic extra-legal outbreaks on the part of racial minorities, which strive for equality in a system based on exploitation and therewith on inequalities in all spheres of social life. They know from experience that democracy has nothing to do with their own conditions and offers no solution for their special problems. Still, they assume that the system could be forced to make some concessions by way of organized protests and direct actions justified in terms of prevailing democratic ideology. But this ideology does not stand in the way of applying the most naked authoritarian measures, if this should be deemed necessary. The apparatus of repression—the army, the national guard, the state-police, the local public and private police forces—are formidable enough to deal with such upheavals. While the apparatus of repression is ever-ready, it can be held in reserve because of the overwhelmingly positive identification of the large mass of the population with the American system. This identification remains intact even when particular policies of the government are questioned or opposed, or when the government itself loses the confidence of large layers of society. The war in Vietnam, for example, was generally not recognized as an aspect of American imperialism, but was bewailed as a morally wrong policy, or as a mere mistake, on the part of the administrations involved in it, which assumedly could just as well have chosen another course of action to safeguard America's interests in Asia. But this war was fought in the name of democracy, to prevent the further spread of totalitarian regimes, and was therefore most heatedly defended in the beginning by the liberal-democratic and even "socialist" elements in the United States. As far as the working class was concerned, insofar as its interests found articulation at all, it was satisfied with the war-given opportunity for secure jobs and higher wages. What opposition arose came from religious groups and pacifists, soon to be joined by a rebellious student movement unwilling to sacrifice careers and even life to the remote interests of American imperialism. Yet this movement used the phraseology of democracy to expose its actual absence at this particular occasion, and merely expressed the utopian quest for a real democracy, brought about by democratic means, within the conditions of American capitalism. With all due respect to this anti-war movement, which did play a part in aiding the growth of aversion to the seemingly pointless extension and prolongation of the conflict, the war came to an end not in response to democratically-exercised anti-war sentiments, but thanks to the defeat of the American armed forces, hastened by the war-weary attitudes of the field soldiers, who had lost all inclination to sacrifice their lives for the incomprehensible goal of defending American democracy in Southeast Asia. The fact that the war itself had become a commercial enterprise—not in the wider sense of serving the expansionary needs of American capitalism, but in the narrower, immediate, sense, of a general corruption on the part of the military and their advisers personally to enrich themselves—also aided this war-weariness. Finally, in conjunction with the then existing constellations of imperialist forces, the war could most probably be won only by risking a worldwide war, for which America was not prepared at this particular historical juncture. Capital itself brought the war to an end, apparently as a response to the opposition at home, but in reality because the expense of the war had lost all proportion with any conceivable future gain that might result from its successful conclusion. Nonetheless, the ending of the war was celebrated as a reassertion of American democracy, as a sign of the power of the people as against that of the government, and even those who at first had endorsed the war as America's commitment to the principles of democracy, now joined the celebration. On the internal scene, a similar situation arose with Richard Nixon's forced abdication of the presidency in the wake of the so-called Watergate affair. A corrupt government was replaced by another corrupt government in a political power struggle lost by the Nixon administration. The ideological verbage displayed in this process created the impression that, once again, democracy had succeeded in defeating its violators and that it was still a viable political system serving the national needs against the usurpation of power on the part of conscience-less politicians. Presumably, an aroused "public opinion" had overcome the underhanded manipulations of the administration, out to secure its perpetuation in defiance of the "fair play" of democracy. The euphoria created by this fresh sign of democratic power was such as to release a general onslaught against its various abuses, reaching the grotesque point of passing laws which subject the investigatory agencies of government to the scrutiny of their victims. 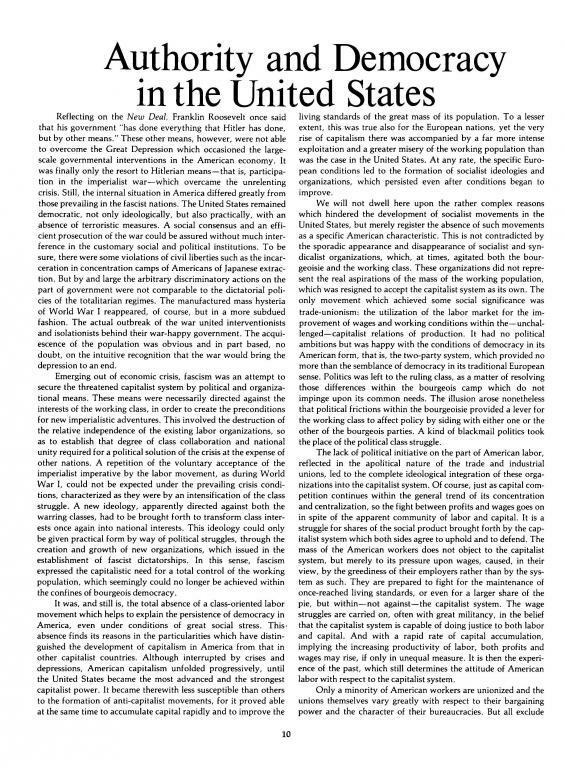 Whereas in other capitalist nations democratic institutions are increasingly supplemented by more direct administrative police measures, in the United States the instruments of repression have seemingly become more diluted, in favor of a more open and a more participatory political life, even though, or perhaps because, little advantage is taken thereof. It would be an error to assume that the hollowness of the democratic rituals are recognized and that the democratic ideology has spent itself. Quite generally, people continue to believe in this system as preferable to any other, and express their patriotism in terms of American democracy. They are not distressed by its merely ideological nature; rather, it is precisely this reduction to ideology which allows for a persistant complacency of the American population under the authoritarian social conditions. This complacency is nothing to be wondered at. The Great Depression of the 1930s is only vaguely remembered and then recalled as an act of God, from which no relevant conclusions can be drawn. Since this period, until recently, America was the toast of the world, the victor in war, and beneficiary of an unprecedented economic upswing which benefited both labor and capital. Theories were concocted which assured further economic growth and the elimination of the business-cycle through state interventions in the laws of the market. True, there remained a residue of misery, particularly with respect to racial minorities, but this, too, would be overcome in time, thus demonstrating the superiority of the capitalist system in its American form. This general optimism created the various notions of "post-capitalism", the new "techno-structure", the "end of ideology", and the coming of "one-dimensional man", all signifying that whatever meager expressions of discontent might arise would be absorbed in a truly integrated capitalist society without class conflicts, in which the difference between authority and democracy would have lost its meaning. All this assumed, of course, the continuous expansion of American capital and therewith its extension on a global scale. The post-war situation was characterized not only by various attempts—some successful, others not—to contain the spread of totalitarian regimes in defense of the free world-market, but also by capital exports on a lavish scale and the intensified creation of multinational corporations, mostly under the American flag. The internationalization of capitalist production (in contrast to international trade) extended the American economy to all parts of the world, a fact of great importance with regard to the identification of American capitalism with political democracy. Business can flourish as well under authoritarian as under democratic conditions, so long as the authoritarianism restricts itself to political institutions. Business has no preferences in this respect, even though some businessmen may prefer one to the other. And in fact a great amount of American capital operates under authoritarian regimes and has a direct interest in their perpetuation as long as they secure and guarantee the profitability of their investments. There are of course two major types of authoritarianism: the state-controlled systems, which imply the expropriation of private capital, whether foreign or native, and some form of central economic planning; and the various military dictatorships that abound in the capitalistically less-developed countries dependent on the capitalist world market and the import of capital. Most of the so-call "third world" countries are in this latter category, a condition described as "neo-colonialism". Here the authoritarian relations of capitalist production find their support in an authoritarian political structure, to assure the accumulation of capital, despite the precariousness of the general economic conditions in which world capitalism finds itself. The militarily-secured rule in these nations merges the political elites with both the emerging native bourgeoisie and foreign capital, in this manner establishing the unity of capital and government which also characterizes the advanced capitalist nations, although with a shift of emphasis from the civilian to the military aspects of capitalist rule. Not admitting that American capitalism is based on the exploitation of labor—since each person is presumed to receive what he has contributed to the total social product—and thus sharing with the state-controlled totalitarian nations the notion of to "each according to his work", the economic argument against such totalitarianism is largely based on the comparative efficiency of the "free" and the "regulated" economy, the latter supposedly demanding totalitarian controls and thus dictatorial rule. Democracy is then only mentioned as a political phenomenon, as a question of "individual liberties" and "human rights", which, however, are presupposed by the property rights of capitalism. With the private-property rights maintained, even authoritarian regimes may develop, or return to, democratic institutions. In this sense, then, the various military dictatorships, particularly in the South-American nations, are not opposed but cultivated by American capital, in the apologetic expectation that, sooner or later, they may adapt themselves to more democratic procedures. In fact, the dictatorships themselves pretend to be mere caretakers for democracy in times of social stress, eagerly awaiting the day of their displacement by viable elected governments and parliamentary rule. The economic and so the political interests of American capitalism touch upon almost every part of the world. Although the nation-state persists, the economic integration of capitalism is international, which strengthens the imperialistic nature of capitalist competition. With respect to foreign capital investments alone, the Government Survey of Current Business of February, 1977 showed that the yearly sales of majority-owned foreign affiliates of United States companies totaled more than $500 billion, while American exports totaled only $120 billion. No data is available for sales of foreign affiliates in which American companies have less than a majority interest, nor for the production of unaffiliated companies under license of United States companies. If they were included, the enormous importance of foreign production relative to traditional exports would be even more evident. This implies, of course, that American capitalism must not be equated only with its democratic pretensions at home, but also with the authoritarian regimes under whose protection it exploits an increasing quantity of foreign labor. It thus shares responsibility for their undemocratic dictatorial policies. It is true, of course, that American capital is not needed to foster authoritarian regimes in countries in which it does business; these nations adhere to dictatorial principles on their own accord. Most likely, the American capitalists would be more comfortable operating under circumstances more akin to their own. But they are also realists and accept the world as it is: democracy is not essential to the making of money. They are also quite ready to enlarge their capital under democratic conditions. So long as their investments are not endangered, the form of government which protects them is quite immaterial, and this indifference allows for adherence to the principle of non-intervention in the affairs of other nations. It is not the desire for a "democratic world" which moves the policy-makers, but merely the need for governments—dictatorial or not—that will protect capital investments and allow for international trade favorable to American capital. However, investments are endangered politically as well as economically when a state of relative prosperity and social stability gives way, as at the present time, to a period of depression and social unrest. In such cases governments may invoke measures detrimental to American capital—up to the point of its nationalization. If such events seem to be in the making, governments begin to matter and it becomes necessary to install ones willing to uphold American interests. Covert and overt American intervention will replace more democratically-inclined governments with outspokenly authoritarian regimes, in order to secure both the specific American interests and the social relations on which they are based—as happened, for example, in Brazil, Guatemala, the Dominican Republic, Chile, etc., all in the name of democracy and the defense of the "free world". But even apart from flagrant intervention, America dominates the economic and political life of her client nations through their financial dependence on the capital market. Just as the peonage of the landless peasant can be maintained by keeping him perpetually in debt to the landlord, so nations can be forced to submit to America's hegemony through their indebtedness to American banks and the American-dominated International Monetary Fund (IMF). If they cannot keep up the interest payments on their loans, which becomes increasingly difficult with the deepening of the worldwide depression, new loans are denied them unless they submit to a program of "austerity" designed to increase, with the profitability of capital, their ability to honor their financial obligations. The IMF has become the vehicle through which economic "Discipline" is imposed upon debtor nations in order to maintain, or restore, their credit-worthiness. Of course, this is just "good business", even though it may result in great social unrest and therewith lead to repressive measures of the most brutal kind. Recently, for example, Peru was placed under martial law, as its military government moved to halt a wave of looting and sabotage provoked by enormous price increases, instituted in order to reduce the payments deficit and to increase the rate of exports. In considering the nature of American capitalism, it is only prudent to include in its economic effects upon other nations also their political repercussions, which, in most cases, involve the application of terroristic measures by dictatorial governments against their impoverished populations. This, too, is part of American democracy, which works hand in glove with the authoritarian regimes, even with regard to the details of political repression via the machinations of the Central Intelligence Agency. It is then not only the predilection on the part of American capital to assert its self-styled economic and moral superiority, as exemplified in its democratic institutions, but the inescapable need to assure its profitability under any and all circumstances, which turns it into an abetter of totalitarian regimes and authoritarian policies in the world at large. But the spreading economic crisis does not stop at the American door, and the same "austerity" advocated abroad must also be applied at home. To be sure, the exceptional economic power of the United States does allow for a more gradual and less extensive reduction of living standards; yet it depends on the unforseeable extension of the crisis whether or not the enforced "austerity" turns into general misery as has been the case in previous depressions. At any rate, the apparent tranquility of American democracy is steadily being undermined by the deepening crisis as well as by the attempts to cope with it, and the still imposing edifice rests upon shifting sand. Thus far, however, no need has arisen to apply political measures to the economic ones, for there have been no political reactions to the deteriorating economic conditions. Unemployment and inflation have not as yet reached dimensions such as endanger the social peace. American democracy still reigns supreme and finds external reasons for its present economic plight in the unfair competition on the part of other nations, the pricing-policies of the oil-producing countries, and the aggressiveness of competing imperialist powers. Insofar as internal reasons are added to the list of American difficulties, they concern, of course, the inflationary wages of organized labor, which are blamed for the lack of investment incentives. It is the gradual character of the economic decline which explains, at least in part, the apparent apathy of both the working population and the middle class despite the continuing reduction of their incomes. It also implies that the full burden of the depression is carried by a minority not large enough to articulate its grievances sufficiently to affect the broad majority, which still sees itself in an enviable position just because of the increasing misery outside their own living conditions. However, the present day lack of political awareness on the part of American labor, manifested in the undisturbed ideology of democracy, does not imply that the working class will not become restive with the worsening of the economic crisis. After all, it is the same working class which, although belatedly, reacted with considerable militancy to the Great Depression and finally forced capital and its government to relieve its misery through tradition-defying interventions in the economic mechanism. There has been no return to the pre-depression "rugged individualism", and the American economy has adapted itself to a form of welfare system which blunts the social frictions associated with crisis conditions. It is then to be noted, as it has been by Professor Douglas A. Hibbs, of the Massachusetts Institute of Technology (as reported in the New York Times of 6 December 1976) that "industrial conflict drops in rough relationship to the success of welfare-state policies in making government the instrument for allocating shares in the national product". The Professor does not consider the limitations of these practices, nor the obvious fact that they must find an absolute barrier in the accumulation requirements of capital, which demand quite definite shares of the national product. Should the crisis deepen, it will be somewhat more than wishful thinking to expect a change of attitude on the part of American labor toward the capitalist system, even though the direction this change may take remains indiscernible. Newly-arising popular movements may very well sidetrack the aspirations of the working class into channels of activity that defeat their own purpose. On the other hand, the absence in America of capitalistically-integrated and by now ossified "left-wing" political parties may lead to the workers' self-assertion and new forms of organized activity more in keeping with their real needs. Moreover, the American crisis is a crisis of world capitalism and its general political repercussions will find a reflection in the United States. But as matters stand today, international capital may try once more to resolve its crisis by imperialistic means, thus preempting the possibility of revolutionary change in a new world war.